Space Sweeper is an experimental guitar hero supergroup featuring Ted Johnson (Tesla Recoils), Brian Lea McKenzie (Electric Bird Noise), & Brian John Mitchell (Remora). Recorded live at Ted Johnson’s Studio 713 (Chapel Hill, NC), then mixed at Brian Lea McKenzie’s Music Factory (Myrtle Beach, SC), & finally mastered by Mitchell at Silberia (Sanford, NC); Alien Oceans is a true collaboration of all three members. A mix of space rock, prog rock, & drone. Space Sweeper is an experimental guitar collective featuring members of drone/ambient stalwarts Remora, Tesla Recoils and Electric Bird Noise — artists whom fans of the Robert Fripp/Brian Eno duo albums would do well to investigate. Ted Johnson, Brian Lea McKenzie and Brian John Mitchell have pooled their talents to create a standout album in a genre that’s still viewed as a fringe interest by many. Although the average music fan would turn up their nose at the idea of instrumental music — let alone extended experimental guitar music — these are the types of sounds that add emotional oomph to films and TV shows. With “Alien Oceans,” Space Sweeper deliver the emotion while allowing the listener to come up with their own movie. The 38-minute album contains two lengthy tracks, “Burial At Sea” (12:39) and “Oceana Galactica” (25:24). Such epic song lengths in the wrong hands could lead to meandering noodling, but these guys grab your attention and hold it. This music ebbs and flows with moments of tranquility and excitement that can’t be properly aired within the constraints of a pop song format. By the time the final strains of “Burial At Sea” drift into the ether you feel as if you’ve experienced something rather than merely listened to something. Johnson, McKenzie and Mitchell all have their own projects to tend to, but hopefully they’ll find time to periodically fire up the Space Sweeper and beam some music down to us. Silber Records has just released, Alien Oceans, the debut album from Space Sweeper, a collaboration between Brian McKenzie of Electric Bird Noise, Ted Johnson of Tesla Recoils and Brian John Mitchell of Remora, all of whom have been featured on FZB. The two tracks offer an expansive journey through experimental guitar based ambient soundscapes. With about an hour of music, the two tracks allow the group to fully explore the freedom that only expanded compositions allow. The result is a record with great depth and texture. A must have. Space Sweeper offers up two satisfying slabs of space rock on the infinite journey of “Alien Oceans”. Within these two piece Space Sweeper employs a symphony of sounds working in unison to deliver absolutely spellbinding works. Riffs drive the point home as the way Space Sweeper utilizes the sound feels reminiscent of Glenn Branca’s approach taken to its logical extreme. No drums, this is music that simply grows without any restraint. From such a far-off distant sound the way that Space Sweeper suggests vast worlds is particularly grand as the stately way the songs evolve feels so refreshing. Rather gentle in tone is the blissful opener, the surprisingly tender “Burial at Sea”. Within this singular piece a single riff consistently rests in the center of the action letting everything else grow around it as it remains the anchor. Throughout the song the many colors of the sound work to develop into something uniformly brilliant. By far the highlight of the album is the gigantic “Oceana Galatica”. Over twenty minutes in duration the song has plenty of room to roam. Space Sweeper takes advantage of this approach as the song has a more drone-like mantra quality to it. Nearly cinematic in scope the song sprawls out until it hits a wonderful, eerie atmosphere that feels akin to a long-lost soundtrack. 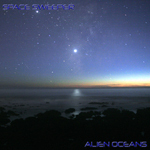 The elegant amplifiers and effects pedals of Space Sweeper’s “Alien Oceans” creates a vast cloud of sound one which lifts the listener up to discover the sky above them. Il proprietario della gloriosa Silber Records Brian John Mitchell (Remora) insieme agli amici Ted Johnson (Tesla Recoils) e Brian Lea McKenzie (Electric Bird Noise) ha dato vita ad un nuovo progetto nato all’insegna del più lisergico space-rock, Space Sweeper. In scaletta sull’album di debutto, Alien Oceans, solo due lunghi brani che mescolano krautrock, progressive e ambient. Burial At Sea parte quasi in sordina, con gli oscillatori dei sintetizzatori analogici e il feedback delle chitarre elettriche a dettare il tempo. Decisamente più maestoso il crescendo su Oceana Galactica, più di venticinque minuti di immaginifiche visioni aliene.